I Can Barely Draw - Where’s Waldo? A Google search page is seen in which the text being entered into the search box is: Waldo. An arrow labeled *Click* then leads to a second page where a search result includes the words "Dictionary" and "Waldo". Navigation menu, Login/register, Numerous irrelevant words, Adobe Flash, Stuff, Copyright, Privacy, Terms of service, Banner ad, Text ads. On the same final page a tiny rectangle is also seen, labeled: Waldo. 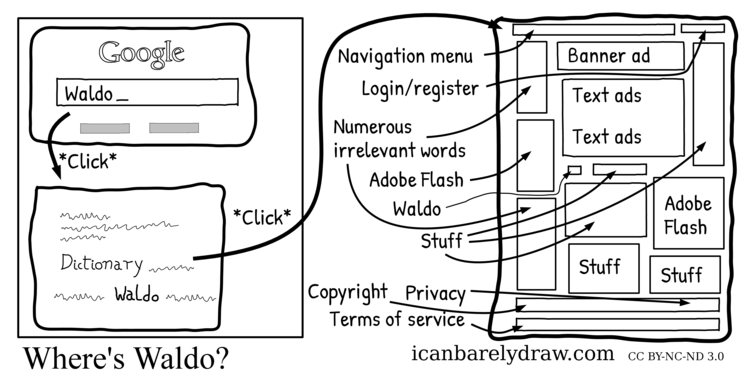 This comic works in lynx, except that is doesn’t work in lynx.